Ajax certainly aren’t feeling sorry for themselves after an unlucky defeat to Real Madrid last time, the Dutch side have been on fire tonight against the Spanish giants. 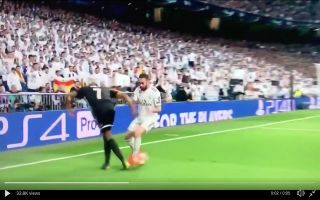 In the 12th minute of the clash, Neres produced a piece of skill that I can’t even think of a name for to leave Dani Carvajal – one of the world’s best right-back’s – red-faced. Ajax’s stars have been pulling out all the tricks this evening, Neres’ teammate Dusan Tadic produced an insane piece of skill to assist Neres for Ajax’s second and talented young midfielder Frenkie de Jong also got his name in the spotlight (if it wasn’t there already) by embarrassing Ballon d’Or winner Luka Modric with his dazzling footwork.